During two chilly winter trips to Denmark and Sweden, I encountered many new foods, including herring in wine sauce, smørrebrød (artfully composed open-faced sandwiches) and reindeer stew. 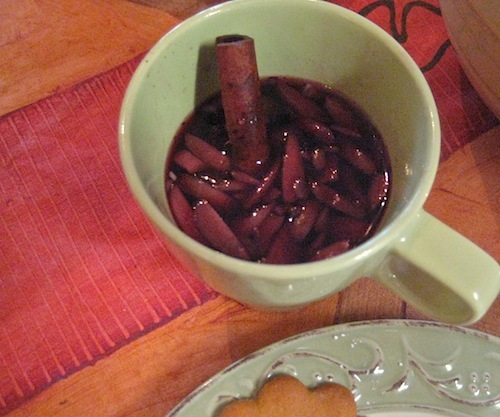 My fondest memories involve coming in from the cold to a warm cup of deep crimson mulled wine — known as gløgg in Danish and glögg in Swedish – which is spiced with some combination of: cinnamon, ginger, cloves, orange peel and cardamom. To amp up the warming properties of the wine, you can add brandy, vodka or aquavit. A delightful inclusion in the drink is a handful of almonds and raisins. This December treat for holiday socializing doesn’t have just one recipe (see recipe links below), but is open to experimentation and family tradition. 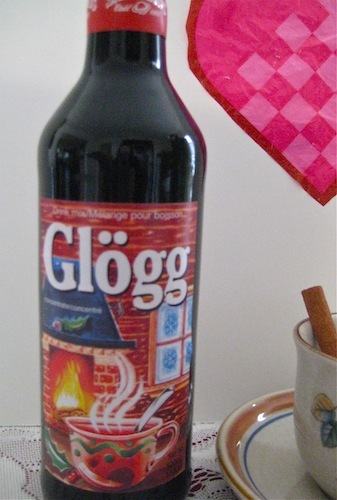 Last Sunday, Kim, my Danish friend here in Berkeley, invited me to sample his gløgg at an afternoon party. It packed quite a punch and I found out his secret: he soaks his raisins and almonds overnight in a combination of vodka and port. Kim mixes red wine with a bottled gløgg drink mix sold at Nordic House in Berkeley, and cautions that the drink should be heated, but not brought to a boil (it would be a shame to lose the effects of all that alcohol). 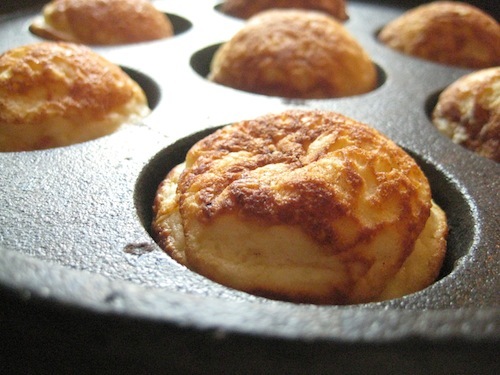 In Denmark, the typical snack to accompany gløgg is æbleskiver – spherical popovers made in a special cast-iron pan with rounded indentations. Again Nordic House comes to the rescue with a packaged dry mix to which you add eggs and milk. Kim explained that he poured the batter into the oiled indentations in the heated pan and when each was ready to turn over, used a knitting needle to skewer and flip it. These moist eggy puffs are unsweetened and are traditionally eaten sprinkled with powdered sugar and dipped in strawberry jam. Thin ginger cookies are another common accompaniment. The “æble” in æbleskiver refers to apple slices that long ago were included in the little pastries but are often omitted nowadays. A band of Vikings that had been particularly hard hit in battle, so, when they got back on their ship with their horn helmets and shields all dented and banged up, they decided to have one of their favorite dishes to help them regain their strength — pancakes! In those days they did not have modern conveniences such as frying pans, so, they greased their shields and poured the pancake batter on them over the fire. 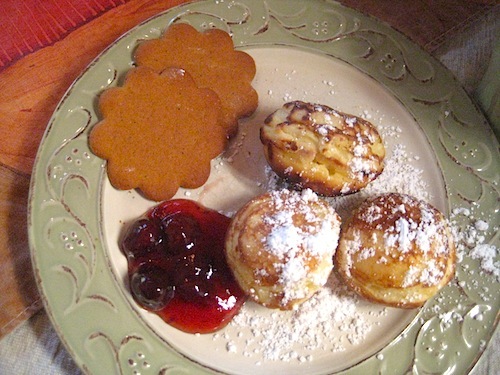 This entry was posted in Denmark, gluten-free food, Sweden and tagged aquavit, æbleskiver, Danish Food, gløgg, glogg, gluten-free aeblskiver, Nordic House, Swedish food. Bookmark the permalink. One of the high points of your blog for me is the great photography that goes with the stories. It makes it so real for me. I can almost taste the stuff!! Thanks, Alan! That really means a lot coming from an artist and architect with a fine sense of design. I’ve always wanted to try æbleskiver! I wonder if it’s possible to make them gluten-free and still maintain that nice, eggy texture? You never disappoint. I look forward to a new year of EBEE.